Also known as the Sunshine State, Florida provides habitats for lizards in its swamplands, forests and coastal regions. This southeastern state has warm temperatures year-round, which is a boon for cold-blooded lizards that maintain their body heat from external sources. Invasive lizard populations have increased since the 19th century and pose as a threat to the survival of Florida's native lizards, which have to compete for food and habitat space. Sand skinks, or Neoseps reynoldsi, are found in Central Florida–particularly Marion and Highlands Counties–and appear to be legless. This lizard has four legs, but they are small and virtually nonfunctional. As adults, sand skinks grow up to approximately 5 inches. These reptiles' natural habitat are sandy areas, as their name suggests, and coniferous forests with pine trees. A sand skink's reproduction period typically occurs in the spring. The reef gecko, or Sphaerodactylus notatus, are only found in the islands of the Florida Keys and coastal regions of the Sunshine State. This dark-skinned gecko grows up to 2.5 inches when they fully mature. Reef geckos are primarily active at night. Humans have chances to see reef geckos under leaves and debris on Florida's beaches; in urban areas, these geckos also live in ornament gardens. Physical characteristics include a pointy snout and boney ridges over the gecko's eyes. Six-lined racerunners (Aspidoscelis sexlineatus) belong in the Teiidae family of lizards; this reptilian family are also called “whiptails,” due to their long slender tails. The six-lined racerunners have dark skin with six light-colored stripes running from head to tail; male six-lined racerunners have blue bellies. Including its tail, these lizards may grow up to one foot long when they reach maturity. The hind legs of six-linted racerunners are nearly twice as large as its front legs. One of the only endemic lizards in the state is the Florida scrub lizard, or Sceloporus woodi. This reptilian species belongs to the iguana family of lizards, although it is one of the smallest iguana species. As adults, Florida scrub lizards grow up to 5 inches. Some of the Florida scrub lizard's physical characteristics are the spiny scales on its back and two dark brown stripes that run from head to tail. Florida scrub lizards are usually found on the state's Atlantic Coast and near Central Florida's lakes. The northern green anole, or Anolis carolinensis, is the only anole lizard native to Florida. This anole lizard is completely green, a coloration that allows it to blend into its forest habitat. Green anoles are found in South Florida sites, including Everglades National Park and greater Miami. 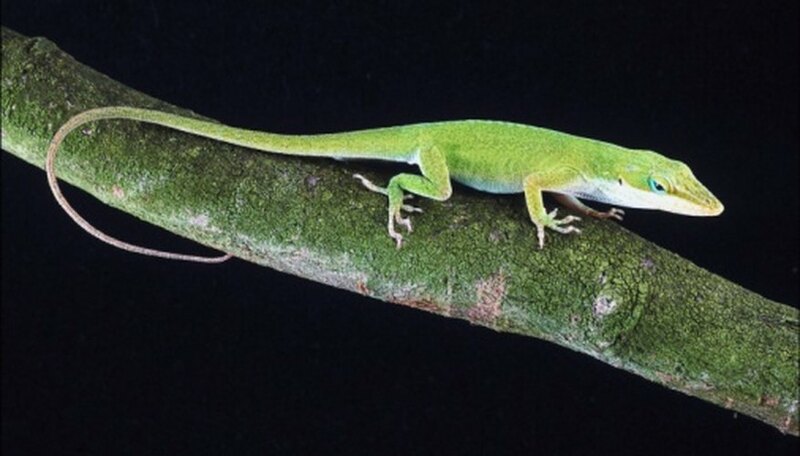 When green anoles feel threatened or excited, their skin morphs into a brownish color. Green anoles also shed their skin on an annual basis. Davis, Skip. "The Types of Lizards Found in Florida." Sciencing, https://sciencing.com/types-lizards-found-florida-8333409.html. 25 April 2017.